Gördes is a town in Western Turkey. It has been a center of weaving at least since the eighteenth century. G6rdes prayer rugs are amongst the most sought-after of all oriental carpets and are distinictive in design. 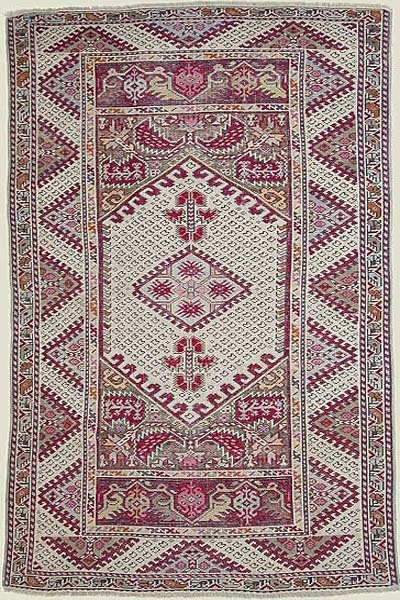 The prayer rugs of Gördes are noted not only for giving their name to the Turkish knot but also for being the group of rugs most influenced by the Ottoman palace carpets. In general these rugs can be distinguished by the following characteristics; the high arch of the prayer niche is finely stepped and has undulating contours; they exhibit and extremely high quality of weaving, using shiny wool in tight knots; and they have a short pile. Vivid red with various shades of green, yellow, blue and cream are the colours most frequently used.